Home › History › The Archbishop, the Chapel Goods – and Mrs. Newton! The Archbishop, the Chapel Goods – and Mrs. Newton! 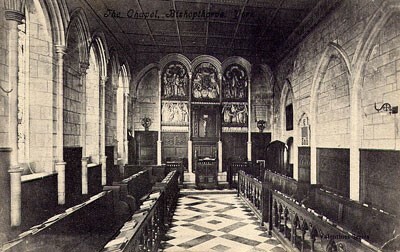 The medieval Chapel at Bishopthorpe Palace, photographed c1905. In 1693, Archbishop John Sharp (1691-1714) began to write in a large book an account of the estates and revenues of the Archbishop of York. On the last page, he compiled an inventory of the effects that belonged in the Palace Chapel. He wrote that it was, “An Account of goods, which I Recd. And which are always to go along with the Archbishop of York”. The latter part of this statement was, unfortunately, over-optimistic. John Sharp’s successor, Sir William Dawes (1714-1724), hardly had time to settle in at the Palace when his housekeeper, Mrs. Elizabeth Newton, “embezzled” a number of items. A note to this effect was added to some of the articles within the list. The parish registers of Bishopthorpe reveal that the light-fingered Mrs. Newton was married to Thomas Newton, a coachman from London and, in 1715, they had a child christened in St. Andrew’s church. No subsequent events were recorded so, perhaps, the couple returned hotfoot to the capital with their booty! In spite of this regrettable episode, Archbishop Sharp’s inventory gives a colourful image of the Chapel interior in the late seventeenth and early eighteenth centuries. The following is a transcription; comments added to the account at a later date are given in square brackets. A large piece of Tapestry at the Altar, of Ananias & Sapphira &c.
A Purple Damask Covering, fring’d with Gold, for the Communion Table both lower and upper part, a Cushion and two Stools, of the same. A Turkey work’d Carpet, on the floor within the Rails. A Dammask Linnen Cloth & Napkin, for the Communion. A Bible, in two Volumes, bound in blew Turkey Leather, Gilt & filleted. Folio. Two Folio Common Prayer books. Two Crimson stuff Curtains & two Cushions of ye same, one of Crimson Damask to lay the Common prayer book upon, the other to kneel on, in the Throne. A Bass Vallens & 2 Curtain Rods. A large Folio Common prayer book bound in blew Turkey Leather, Gilt, & filleted. A Cushion to sit on. For the Pulpit, A Purple Damask Cushion, with deep Gold fringe & Tassels. A Bass. For the Desk, A Purple Damask Vallen, with deep Gold fringe. A Folio Bible, & two Folio Common prayer books [†] A Surplice & a black hood. Two Basses, two Iron Candlesticks. Seven prayer books in Folio, 2 of them large paper. Six in quarto, besides the Chappel Clerk’s, eight in Octavo. Most of them old & pretty much worne. Three Douzen of Large Basses, a douzen & half of smaller. Much has been altered in the Chapel over the years and the listed property would have become worn, faded and not always replaced. The pulpit and throne mentioned above, for example, were removed following major restoration in 1892. Despite this – and Mrs. Newton – we are rewarded with John Sharp’s detailed account which provides an insight into the lavish world of York’s eighteenth-century Archbishops. Archbishop Sharp’s Manuscript, Volume 2: Borthwick Institute: Bp.Dio2. Filleted: Plain lines impressed on leather binding and, in the above examples, filled with gold. Turkey carpet: A carpet manufactured in or imported from Turkey, or of a style in imitation of this. It was made in one piece of richly-coloured wools, without imitative pattern and, having a deep pile, cut so as to resemble velvet. Definitions taken from the Oxford English Dictionary. I am an historian and PhD candidate at Oxford Brookes University – I found this article as I am currently working with Archbishop Sharp’s diocese books in support of my current research. I hoped to further clarify a few points you mention. Volume two of Archbishop Sharp’s books of the diocese was updated by subsequent archbishops right up to the 1770s. The account quoted above is in fact in the hand of Archbishop Sir William Dawes, dating it to 1714-1724. In turn, the curious annotations to the account are in the hand of Lancelot Blackburne, archbishop from 1724 to 1743 – he also signs near the foot of page as ‘L: Ebor’. It seems logical that Blackburne would have made his comments soon after his first summer at Bishopthorpe at 1725 – presumably, the devious Mrs Newton made away with the desk sometime after Dawes’s death in 1724. I appreciate the background information on Mrs Newton! Thank you Daniel – I appreciate the clarification.